Nepal is a country where many travellers come for the mountains but come back for the people. It’s a land of great diversity known for its natural beauty and unmatched hospitality. Nepal boasts an extremely vibrant culture, which varies as much as the regions and people groups. In recent years Nepal has been experiencing monumental changes from the social and cultural to the political and economic. With a tumultuous recent past of civil war and political unrest, Nepal is a country in the midst of a difficult transition. One quarter of Nepal’s population is estimated to be living below the poverty line, with remittances making up as much as 25% of GDP. Agriculture makes up 33% of the GDP, providing a livelihood for 70% of the people who live in Nepal. The unemployment rate in Nepal is 50%, and only half of the population aged 15 or over can read and write. In April 2015, a 7.8 scale earthquake hit Nepal, and was followed by aftershocks including a 7.3 scale earthquake in May. These events killed over 10,000 people, injured 20,000 and left 2.8 million in need of food, shelter and assistance. The aftermath of the earthquakes will have a devastating effect on the economy of this already fragile country, and the rebuilding cost over the next 5 years is estimated at £4.5 billion. Gyan joined International Needs Nepal as Executive Director in January 2018. 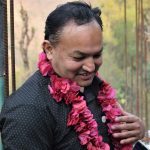 He trained as a science teacher and previously worked for World Vision International Nepal as a Community Development Coordinator. Gyan has worked in development for over 15 years. Help us create a sustainable future. Join the family.